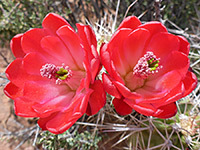 A common, widespread and variable species, echinocereus triglochidiatus is best identified by its flowers, which are orange or red in color and have rounded petals; other hedgehog cacti have pointed petals of different colors, the other exception being echinocereus coccineus. These two species are almost identical, and their ranges overlap in two states (Colorado and New Mexico), but the former has generally fewer spines, fewer ribs (these vary from 5 to 8) and more widely separated spine clusters. The only definitive way to distinguish the two species is to analyse their chromosomes. 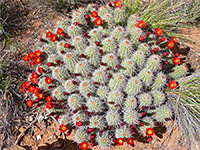 Spines of echinocereus triglochidiatus range between half an inch to 4 inches in length, with centrals somewhat longer than radials, are usually light in color, and not dense, allowing the dark green stems to be visible, but in some specimens the spines are darker and more densely spaced. 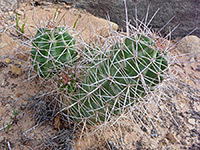 This is one of the most branched species of all cacti, often forming a rounded clump of hundreds of stems, many feet wide. Aside from the natural differences in form and spination, there are several named varieties including var arizonicus, found in central Arizona (sometimes considered to be a separate species); this has ribs that are slightly spiral rather than straight, and rather thicker spines.